Last night at the Golden Globes, Sylvester Stallone won Best Supporting Actor for his performance as the iconic Rocky Balboa in Creed, with many awards season analysts believing he may take home the Oscar next month. During the ceremony last night, Variety spoke with MGM CEO Gary Barber, who revealed that he plans on releasing the sequel Creed 2 in November 2017. 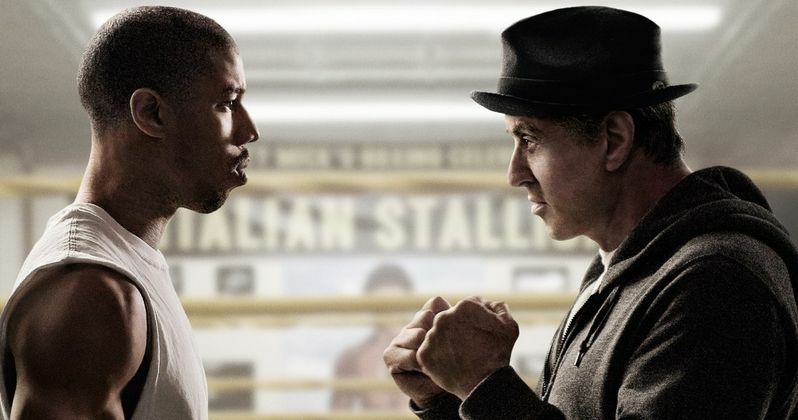 While he wouldn't give an exact release date, that would put the sequel in theaters almost exactly two years after the original Creed debuted. The CEO added that the release date isn't set in stone yet, but he says it's his "goal" to roll out the follow-up in November 2017. As of now, the November 2017 release schedule already has a number of high-profile titles. Thor: Ragnarok and My Little Pony are currently scheduled to open on November 3, 2017, with the Murder on the Orient Express remake set for November 10, 2017. Justice League Part 1 and Dr. Seuss' How the Grinch Stole Christmas are set for release on November 17, 2017, with Coco set for November 22, 2017. It would seem likely that MGM would schedule Creed 2 for either November 22, 2017 or November 29, 2017, but that hasn't been confirmed yet. This report also reveals that Creed director Ryan Coogler may not be able to return for this follow-up, since he was recently confirmed to direct Marvel's Black Panther, which is set for release on February 16, 2018. Earlier this month, Sylvester Stallone revealed that the sequel may reunite Rocky Balboa and Apollo Creed (Carl Weathers), with portions of the story taking place in the past. Apollo Creed died in the ring during his fight with Ivan Drago in the 1985 sequel Rocky IV. The report from last week hinted that Ryan Coogler may stay on as an executive producer, but it isn't known if he will be involved in writing the script. The filmmaker co-wrote the original Creed script with Aaron Covington, but it isn't known if the co-writer is also coming back for this follow-up. Some have speculated that Ava DuVernay (Selma) could step in to replace Ryan Coogler, which would prove to be quite ironic since she was previously up for the Black Panther directing gig that Ryan Coogler has landed. Creed has earned over $105 million at the domestic box office so far, with just $14 million coming from international markets for a worldwide total of $119.6 million, from a $35 million budget. It's possible that the return of Apollo Creed in the sequel could provide a significant box office boost for the sequel, but we'll have to wait and see. Are you glad that Creed 2 may hit theaters in just two short years?